The Downtown NOLA Party was held at the Lucky Lounge, which I seem to remember being Antone’s at one time, and as soon as I walked in, I ran into members of The Stooges Brass Band, one of my favorite New Orleans groups. The place was somewhat crowded, but not uncomfortably so, and the Stooges had been hired to provide the music which they did, with a more indoor version of their group featuring a set drummer and keyboard player rather than the street style they typically display outdoors. Still it was upbeat and fun, and was apparently being sponsored as an opportunity to lure tech businesses to downtown New Orleans. Toward the end of the evening, an unexpected guest appeared, the legendary Bushwick Bill from the Geto Boys. He joined the Stooges on stage for a freestyle before the end of the evening. I had no problem finding free legal parking on Esplanade, and when I made the short walk over to Frenchmen Street, I was surprised to find a large brass band playing on the corner of Frenchmen and Chartres, opposite the Praline Connection, and the old corner where brass bands used to play, which was now occupied by a building under construction. I was somewhat surprised, because over the last couple of years, police have made a point of harassing brass bands on Frenchmen Street and running them off the street for lack of the appropriate city permits. Tonight they seemed to be playing to their hundred or so fans unmolested, and I could only assume that the current tolerance was due to two factors, the current mayoral election, where Mitch Landrieu is running for reelection, opposed by a couple of African-American candidates, and the city council’s current efforts to pass a restrictive noise ordinance. Mayor Landrieu probably would not want to strengthen his opponents by heavy police crackdowns on predominantly-Black brass bands, and with the city council trying to secretly pass a new noise ordinance, and already drawing opposition from musicians and community advocates, they would hardly want to animate the opponents by police harassment of the bands either. 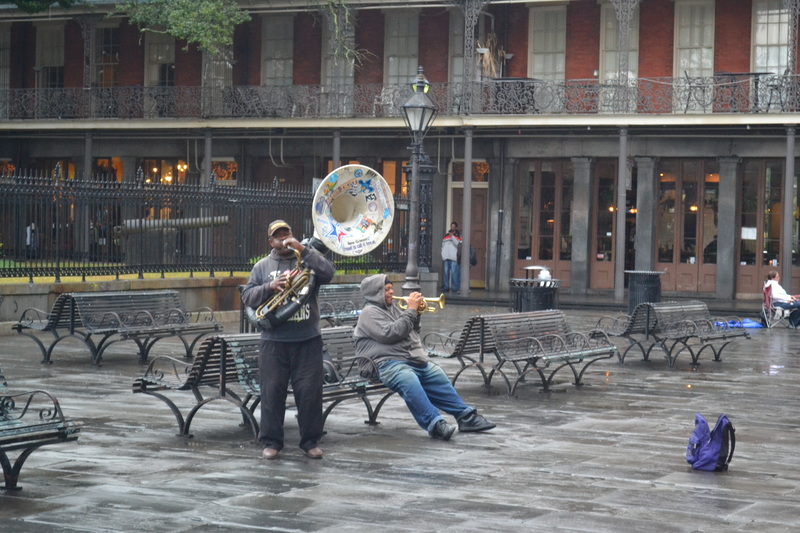 I even saw a brass band on Bourbon Street near Canal, the first one allowed to stay there in two years! At any rate, the brass band playing under the brightly-painted eaves of Yuki’s building proved to be the Young Fellaz Brass Band, a band closely associated with Frenchmen Street, where they first came to public prominence. They are really a lot of fun.